I’ve been working on a crypto wallet for Bitcoin and all the cryptocoins inheriting from Bitcoin. 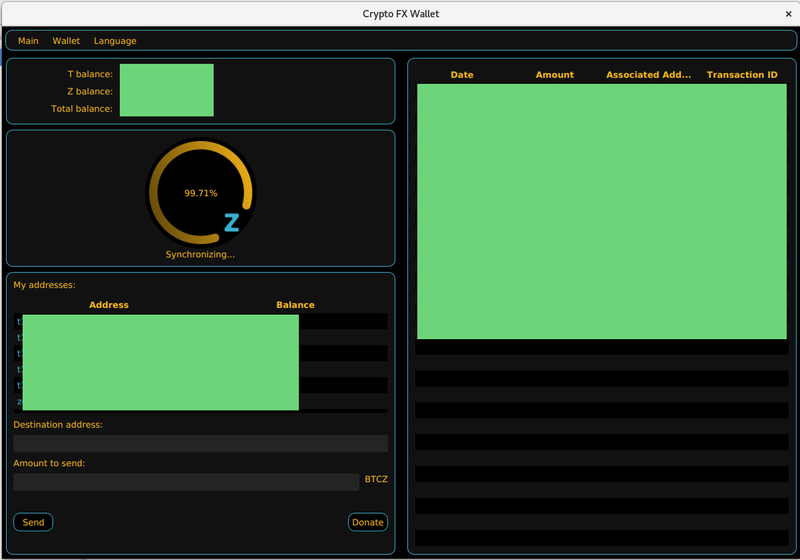 I did several tests on BitcoinZ and the default GUI was thought on BitcoinZ. If you want to watch it and send me your feedback you can see it on https :// github .com/donlaiq/cryptofxwallet. Oh, yes. Until now you should see something similar to the next screenshot (without the green rectangles). You can look the video splashscreen on https://www.youtube.com/watch?v=_5mGiE_eFDk if you want. Currently, I’m working on it to do several changes. When open wallet to synchronized also open automatic a new file wallet. dat? how can I encrypted wallet when open wallet and I need make transaction? thank you ansver. The wallet is aimed to miners or people running full nodes. Basically it is a layer above the command line wallet, with a nicer GUI to work with, so it’s supposed they have created the .dat file before running it. from the command line to enable the wallet encryption. New version of the application. Now you can set up the desired node directly from the GUI. To see a guide about how to use it you can see https://www.youtube.com/watch?v=3amZLwUk7C4. To see the source code, remember to visit https://github.com/donlaiq/cryptofxwallet. Nice! I will test it ASAP ! Thanks for your work. For sure, it will need more work to get polished, but there are some interesting things from the last update. Need to test it, thank you for sharing! Crypto wallet for Bitcoin and all the cryptocurrencies inheriting from Bitcoin, sounds nice! Especially, if it is aimed to miners or people running full nodes! Btw, what exchanges do you guys usually use for trading? 2 days ago, I came up with the exchange GetEx… because it’s regulated by the EU I suppose it’s worth trying it, right? I have not enough time to do it, but I would like to create a new video showing how easy is to add support to a new cryptocoin, adding just a few pieces of code. Currently, it’s supposedly ready to use with BitcoinZ, Bitcoin Core, Qtum and ZCash. I’m saying supposedly because I haven’t any BTC, QTUM or ZEC to try it, but given that it’s a layer running over a full node and it’s calling the commands from the node, it should work. My guess is that it should be a piece of cake to add support for another cryptocoins as Bitcoin Cash, Bitcoin SV, Dogecoin, Litecoin, etc. Let’s see what’s this new BitcoinZ update brings!